Shirts With Random Triangles: Florida kicker Eddy Pineiro charged with kicking and damaging scooters. "Pineiro was cited for a misdemeanor charge of property damage/criminal mischief earlier this month, according to Alachua County court records filed yesterday. According to a sworn complaint from the university police department, Pineiro "began pushing over scooters that were next to his. Pineiro damaged two scooters by kicking them, and then ripping off the side mirrors." Pineiro reportedly did $800 in damage to the scooters. 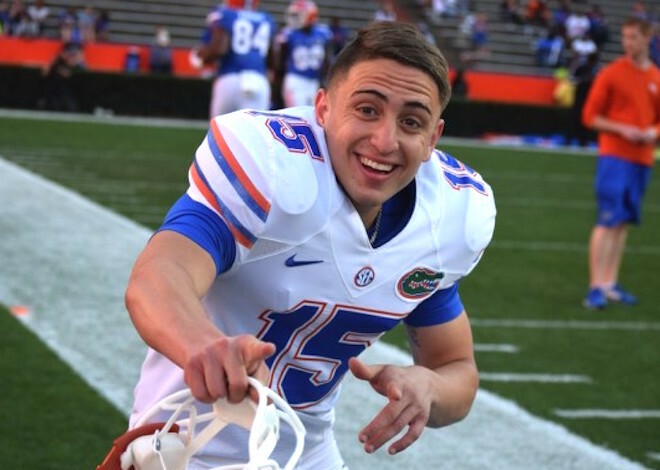 According to several reports Florida head coach Jim McElwain was apparently not aware of the incident involving Pineiro when asked about it in a press conference on Wednesday. Pineiro is still reportedly set to participate in Florida's road game against LSU on Saturday.